Our short US Dollar outlook continued to play out through today’s trading and hitting new lows against the Japanese Yen, but it do so without hitting our short entry point at 104.00. With the pair currently trading at 102.50, we will close our open orders. No trade. So, we were right on direction once again, but a little off on entry. This goes to show that sometimes it may be prudent to scale into positions. We can never know the exact turning point in a market, so going in or taking out small portions of your position at a time can reduce the probability of missing a move and possibly catching a better price. We have US Jobs Data tomorrow, which means another big day for the Greenback. So, stay tuned for a trade idea tonight. See ya then! Today, I’m going to keep it pretty simple…sell the US Dollar! More interest rate cuts from the Fed, US in a recession, and after today’s ADP report, another month of negative job growth?? Why not sell? On the chart, we can see a very shallow retracement before the pair found sellers once again around 104.00. 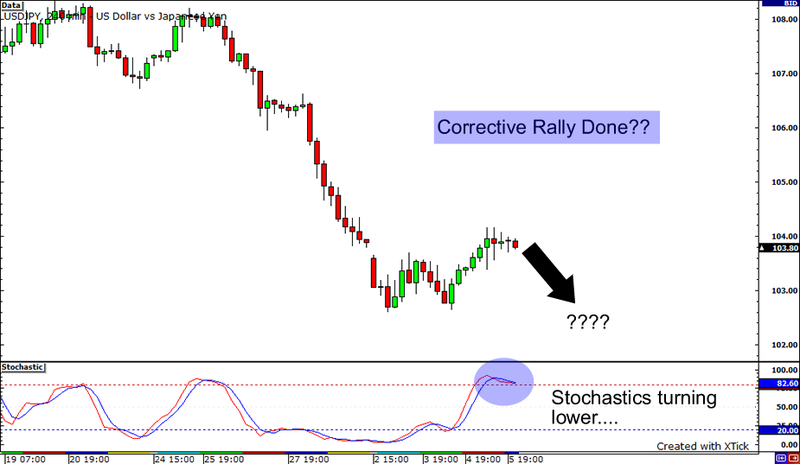 Stochastics are moving lower out from overbought levels indicating the short rally may be close to done. So, we will short based on the price action and see if USD/JPY touches lows it hasn’t seen years.